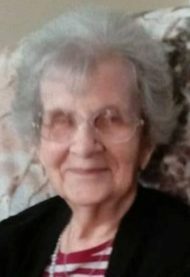 Naomi Irene Young, 97, of Lancaster, unexpectedly passed away Tuesday, January 15, 2019 at UPMC Heart of Lancaster Regional Medical Center. Naomi was born in Lancaster, daughter of the late Clayton B. and Emma E. Snavely (nee Hacker). She was predeceased by her husband, Vernon H. Young, three sisters, and one brother. Naomi is survived by her daughter, Judith A. Buehler of Lancaster, Pennsylvania; one sister, Grace Robinson of Winston-Salem, North Carolina; three grandsons, Brian D. Buehler of Hampstead, Maryland, Christopher S. Buehler (husband of Jill) of Hillsdale, New Jersey, and Timothy J. Buehler (husband of Emi) of Raleigh, North Carolina; three great grandchildren, Amber, Alexander, and Amelia; and one great-great granddaughter, Dasia. Naomi graduated from Lititz High School in 1939 and was a longtime resident of Millersville. She retired from John Herr’s Village Market. Naomi had an adventurous spirit, a great sense of humor, and loved to travel. She loved animals, yoga, and the occasional glass of champagne. She had a loving nature and will be greatly missed by all those who met her. A viewing will be held at the Charles F. Snyder Funeral Home & Crematory at 3110 Lititz Pike in Lititz on Saturday, January 19th between 11 am and noon. A celebratory service will be held on Saturday, January 26th at 11 am at the Lancaster Moravian Church, 227 N. Queen St. (second floor) in Lancaster. In lieu of flowers, memorial contributions in Naomi’s name can be sent to the Lancaster Moravian Church through the mail: P.O. 1327, Lancaster, PA 17608.